The 1119 UHF RFID Reader provides a UHF RFID upgrade path for Motorola MC55, MC65 and MC67 terminals, capable of reading and writing to Class 1 Generation 2 (ISO 18000-6C) transponders. The device has a read range of up to 1.5m (5 ft.), depending on the type and number of transponders. 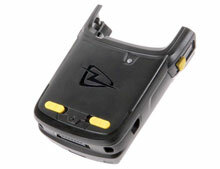 The 1119 UHF RFID Reader"s rugged IP54 design matches the capabilities of its host terminals. UHF RFID Snap-On Reader for the Motorola MC55/65/67 (FCC). Includes Reader, Battery, SDK, Tags, 2 Locking Plates, and Display Case. UHF RFID Snap-On Reader for the Motorola MC55/65/67 (FCC). Includes Reader and Battery. 4-slot battery charger. Power supply (Part# PWRS-14000-148R) sold separately.